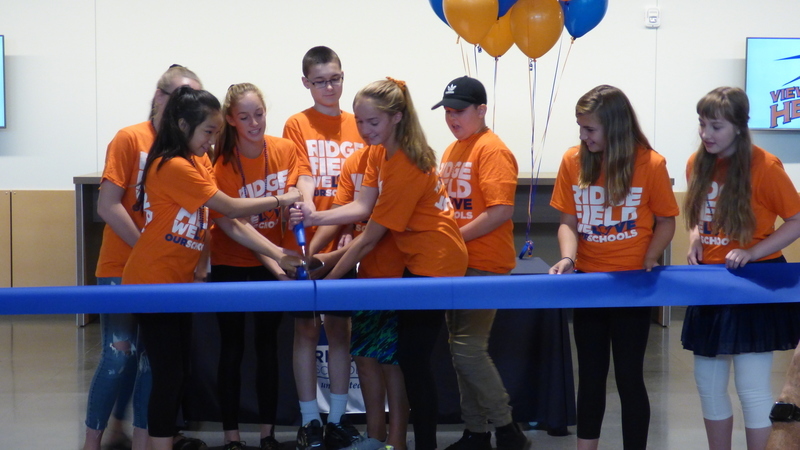 The first schools to be built in Ridgefield in more than 40 years—a new fifth and sixth grade intermediate school (Sunset Ridge Intermediate School) and a replacement of View Ridge Middle School for seventh and eighth graders—was celebrated with a ribbon-cutting ceremony on Saturday, September 8. The new campus, made possible by the successful passage of the district’s school bond in February 2017, has come a long way since its initial groundbreaking in May 2017. Since then, the community has watched the site evolve into an impressive two-story, 145,000 square foot facility with 44 modern full-size classrooms, two gymnasiums, a multi-purpose/wrestling facility, spacious library-media center, a life skills suite, band and choir rooms and a state-of-the-art black box theater. 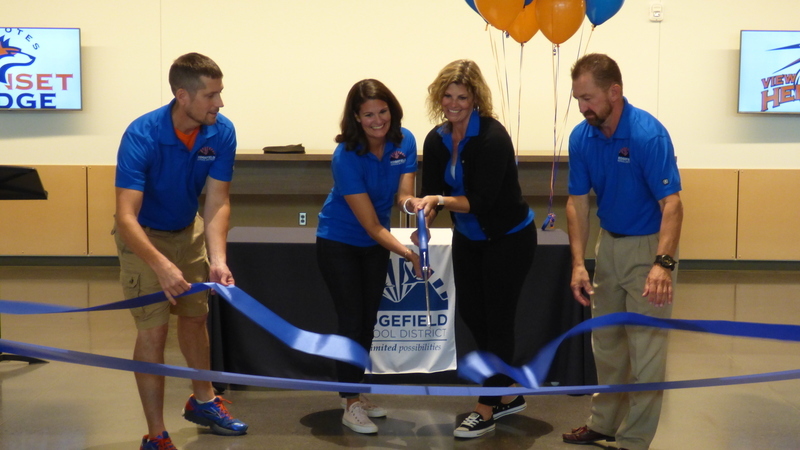 Superintendent Nathan McCann and school board members Emily Enquist, Becky Greenwald and Scott Gullickson cut the ribbon to officially open the 5-8 schools campus. View Ridge Middle School students (L-R): Uruwa Abe, Reagan Mendenall (behind), Cameron Jones, Andrew Wilken, Claire Jones, Tyler Whitmore, Elle Michaud and Marie-Claire Mockovak.